The joke in the US State department is that Hans Blix is like a Volvo - solid and reliable. It is a double joke, because Colin Powell, the US secretary of state, is famed for his love of old Volvos. Perhaps it is the freezing weather in New York at the moment, but this was the day the Volvo failed to perform as expected. Everyone thought they knew what Dr Blix, the chief weapons inspector, was going to say in his report to the Security Council. A little progress from Iraq since his last report, but no fundamental change. And that is, roughly, what he did say. But the impact of Dr Blix's remarks were the opposite. It took one sentence in Dr Blix's last report, in January, to condemn Iraq for its lack of commitment to disarmament. This time, there was no sound bite. Instead the chief inspector tiptoed delicately along the tightrope, condemning Iraq for breaching the rules on missiles, but also criticising evidence presented to the council last week by Mr Powell. It was a supreme example of the Swedish prerogative: neutrality. But from that point on, somehow the momentum slipped away from the Americans. With the world watching, French Foreign Minister, Dominique de Villepin, delivered an impassioned defence of his country's opposition to war. "The message comes to you today from an old country," he said, a pointed reference to the "Old Europe" jibe from US Defence Secretary Donald Rumsfeld. An old country that, he said, "has never ceased to stand upright in the face of history and before mankind". That provoked a rare event - a round of applause in the security council chamber - a round joined at the table itself by the Chinese Foreign Minister Tang Jiaxuan. There was more applause a few minutes later for a similar message from Russian Foreign Minister Igor Ivanov. Current Security Council President, German Foreign Minister Joschka Fischer, had to appeal for silence - joking that applause was not allowed, even on St Valentine's Day. On the other side of the council table Mr Powell seemed almost to be sulking. He stopped taking notes, sitting furiously twiddling with his pen. When it was his turn to speak, he discarded his notes, and angrily addressed the inspectors and the other members of the council. So what is the impact of this remarkable turn of events? 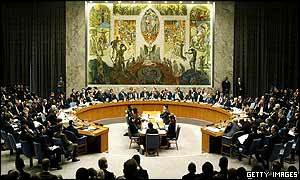 It was a day, for once, when the Security Council fulfilled its founders' purpose. The world gathered in this room to debate an urgent issue of international peace and security. How rare it is to see diplomacy played out on such a public stage. But could it be the last hurrah for the United Nations? US President George W Bush must be thinking very seriously now about ditching his attempt to win a new Security Council resolution, in favour of going it alone. Going to war with Iraq with the international community this badly divided could split apart international institutions. That, by the by, would be devastating for the political prospects of British Prime Minister Tony Blair, who has put so much personal credibility on the line. Mr Powell, also, must be worried that his hardline rivals within the Bush administration will be having a field day. So the immediate impact - yet more talks, yet more inspections. And the world reconvenes here in two weeks time, to hear yet another report from the old Volvo, Hans Blix. "It was not an assessment that chimed with the US and UK view"
"Iraq itself must squarely tackle this task"
"We have to date found no evidence of ongoing prohibited nuclear activities"